Situated in the district of Daltonganj, Palamau Sanctuary is spread over an area of 979sq.km. The core area of 232 sq. kms of the sanctuary was declared as Betla National park in September1989. The park occupies the western parts of the Chotanagpur plateau and was constituted in the year 1960 as an extension of the Hazaribagh National park. 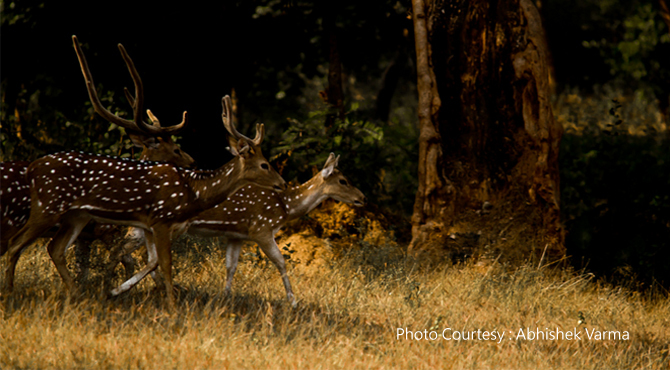 Palamau has the distinction of being the forest where the world's first tiger census was enumerated in 1932. The park became one of the earliest 9 tiger reserves in India under 'Project Tiger' in 1974. The forests of the park have a vast range of vegetation consisting of tropical wet evergreen forests in the lower reaches, mixed (moist & dry) deciduous forests in the middle and temperate alpine forests in the upper reaches including Sal and bamboo as the major components along with a number of medicinal plants. The river Koel and its tributaries run through the northern portion of the park. There are grasslands in the river flowing area. It has waterfalls and hot springs too. Once the seat of Chero kings, there are two historical forts, one of them belonging to the 16th century deep inside the forest. The main sentinel of the old fort is visible high up on the hill with defences in three directions and three main gates. Described as one of the finest parks in the north-east for observing a variety of wild life from close range, there are elephant rides and jeeps available with guides and spotlight for venturing inside the park. Watch towers and ground hides have been constructed to view the wild life. Only group travel is recommended. Timings are from 0500 to 1900 hours.